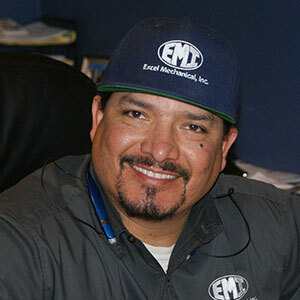 William Godinez | Excel Mechanical, Inc.
William “Will” J. Godinez was born in Tucson and raised in Nogales. Will started in the HVAC Industry 18 years ago as an apprentice. Over the years he has taken college courses, various safety classes and other training programs to further his knowledge and become a “competent person” in the Construction Industry. Beginning in 2010 he took over managing 20-25 employees as the HVAC Department Manager for Excel, successfully completing a diverse array of both Commercial and Residential projects. In January of 2014, Will became Vice-President of Construction due to his commitment to the company and its continued success. On a personal level Will enjoys spending time with his five children. He volunteers as a Youth Football Coach and has founded an organization that teaches children football fundamentals free of charge.